The constant hum of electricity. The inviting flash of rows of LED displays. The ability to watch a Top Chef marathon AND exercise at the same time. One of the most popular areas of any gym is the cardio fitness room. With some many members using the equipment, it is vital to understand the best ways to clean and protect your cardio equipment. These days, equipment manufacturers are outfitting fitness machines with more and more bells and whistles. These features make gym members want to use them and fitness club owners to buy them. It’s crazy. I was shopping for a treadmill for my home gym, more an oversized closet than a gym. I couldn’t believe the options you could get on these things. USB docks, cooling fans, heart monitors, pulse monitors, televisions, virtual running trails. The machines had everything shy of giving me my horoscope. I felt like I was looking at options on a Lexus instead of an exercise machine that was designed to make me a sweaty, miserable mess. Like a Lexus, those bells and whistles are expensive. If your facility is going to invest thousands of dollars in each exercise machine, you need to protect that investment as much as possible. 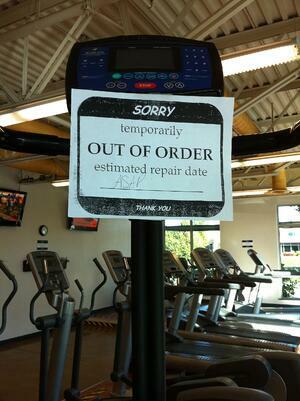 That means not only routine maintenance but instructing your staff and gym members on proper cleaning protocols. Yes, there is a wrong way to clean gym equipment. Never, ever, EVER spray chemicals or water directly onto your electrical equipment. Does your facility use spray bottles and towels to disinfect equipment after use? Your gym staff and members should always spray the disinfectant on the towel first and then wipe down the machine. Spraying any liquid onto any electrical equipment or display is asking for an expensive repair. Here’s a good rule of thumb – if you wouldn’t do it to your iPhone, you shouldn’t do it to your treadmill, climber, or elliptical machine. We recommend avoiding this problem altogether. Remove spray bottles from your cardio fitness area. Pre-moistened equipment wipes available in a wall mounted gym wipe dispenser is a simple solution. Members who use gym wipes still have the opportunity to wipe down and disinfect equipment. But wipes come without the risk of causing damage to electrical circuits. They are safe, inexpensive and foolproof. Your staff can still use spray disinfectant throughout the day for routine cleaning, but with a more controlled and trained approach.